1. She built her career on the exploitation of black culture. Like her character Hannah Montana, Cyrus enjoys getting the "best of both worlds" by immersing herself in "ratchet culture" while reaping the benefits of white privilege. 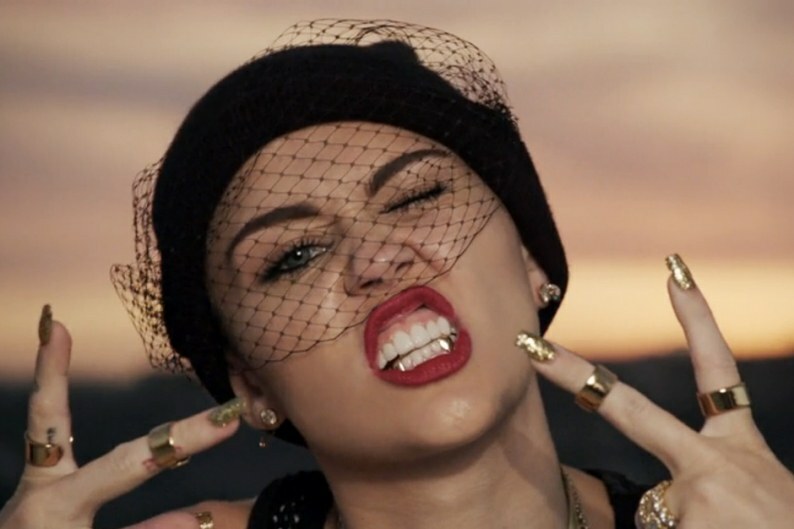 Bandanas, gold grillz, big hoops, and provocative clothing historically belong to a community that shares a struggle Cyrus has never had to endure. Miley has the luxury of taking off her "costumes" and living her life as every other wealthy white woman does. Cyrus has also made a huge profit off "twerking," a dance that was adopted by a New Orleans' Hip Hop movement that focused on good times and small pleasures in an otherwise marginalized setting. Miley uses twerking as one of her method's of sexual empowerment. Yet although widely criticized, she is under the impression that the backlash she receives is solely based on her sexual behavior rather than her racial ignorance. 2. Uses women of color as "human props." Remember when Gwen Stefani was called out for using Japanese women as accessories during her musical career? Add Cyrus to the list of white woman in the music industry exploiting women of color in music videos and performances. Even though she has been repeatedly called out for it, she refuses to acknowledge that surrounding herself with Black women and basically saying "look at me, look at me!" has some serious racist connotations. Using Black women to gain "urban" credibility is not okay. Oh, and just for the record, having the approval of two or three rappers does not justify her behavior. 3. Expects her thoughts on sexism to be heard, but silences women of color. It is already so hard for women to be heard as is. Being of color just makes that struggle twice as hard. Instead of listening to what Minaj had to say about the music industry, Cyrus blamed her for making it about race. In an interview, she said, "If you want to make it about race, there’s a way you could do that. But don’t make it just about yourself. Say: 'This is the reason why I think it’s important to be nominated. There’s girls everywhere with this body type.'" Not only did Cyrus silence a woman who had the guts to speak up, she also tone-policed her. Feminists are constantly criticized for the tone they use when talking about female oppression. People of color are constantly told they are overreacting or being too sensitive. News flash: if you are being marginalized being polite is irrelevant. 4. Perpetuates racial stereotypes that hurt Black women. Cyrus also said, "What I read sounded very Nicki Minaj, which, if you know Nicki Minaj is not too kind. It’s not very polite...But I don’t respect your statement because of the anger that came with it." Once again, a Black woman speaks up and she is stereotyped as the "Angry Black Woman." Black women's activist efforts are constantly derailed by this stereotype. As if their points were less valid because of the emotion that comes with them. You can't minimize someone's experience just because you feel uncomfortable with the emotions that they ensued. 5. Seems to value Black culture, but not enough to value Black lives. Lastly, Cyrus insinuated that she did understand what it meant to be Black. "I know the statistics. I know what’s going on in the world." Interestingly enough, Cyrus has never used her love for Black culture to raise awareness about the hundreds of Black men and women being killed every day. They say, "white silence equals white consent." It couldn't be more obvious that the only Black lives she cares about are the ones that dance in her videos and the ones she smokes weed with. To sum it up, Cyrus is white feminism at its peak. What she calls female empowerment, I call "Miley empowerment." Using feminist wisdom to support her agenda is totally missing the point. From her blonde dreads to her offensive language, Cyrus deserved to be called out. She needs a harsh reality check.